Fierce competition for quality horses among an exceptionally deep buying bench generated healthy results as Keeneland's November Breeding Stock Sale concluded Saturday. Buyer confidence carried forward from the September Yearling Sale, spurring premium prices; increases in average and median; and the sale of 18 horses for $1 million or more, led by the $6 million paid by Coolmore's M.V. Magnier for the champion filly Stellar Wind, to record the co-second-highest-price ever paid for a broodmare prospect at Keeneland. Cumulative sales for the 12-day auction, held Nov. 7-18, grossed $202,021,700 for 2,424 horses, dipping 6.13 percent compared with last year's 13-day total of $215,213,000 for 2,653 horses. Average price of $83,342 rose 2.74 percent from $81,121 in 2016. The median surged 22 percent, from 25,000 last year to $30,500. The 2016 November Sale included the Complete Dispersal of Conquest Stables, which sold 100 horses for $11,207,500. Donato Lanni, Director of Bloodstock Services for Hill 'n' Dale Farm, agreed. “November was a continuation of September; it was electric,” Lanni said. “There was a big appetite for quality horses. Anything with quality brought a lot more than what we thought they were worth. So that's a good sign, a good indicator. A number of positive indicators evidenced the depth and strength of the market throughout the two-week auction. The premier Book 1, held during the first two days of the sale, produced 17 of the sale's 18 seven-figure horses and increases in average and median prices despite cataloging 115 fewer horses than last year. Those gains created momentum that rippled through the sale; the largest single-session gains occurred on Days 4 (Book 2) and 6 (Book 3), when gross sales rose 33 percent and 46 percent, respectively, and fueled double-digit increases in average and median. The clearance rate for the entire sale improved significantly over 2016 as the total number of horses not meeting their reserve fell by 18.46 percent. Purchases at the top of the market were spread among a diverse clientele. Fourteen different buyers representing interests in the U.S., South America, Ireland, England and Japan accounted for the 18 horses sold for $1 million or more. Major domestic and foreign buyers from 20 countries – Argentina, Australia, Brazil, British Virgin Islands, Canada, Chile, China, France, India, Ireland, Japan, Korea, Peru, Philippines, Qatar, Saudi Arabia, Scotland, Turkey, United Arab Emirates and the United Kingdom – bought horses at the November Sale. Lane's End, agent, consigned sale-topping champion and multi-millionaire Stellar Wind, who, said buyer M. V. Magnier, will be retired and bred to Triple Crown winner American Pharoah. The $6 million paid by Magnier for Stellar Wind made him the sale's leading buyer by gross. The partnership of John and Leslie Malone's Bridlewood Farm of Florida and the Solari family's Chilean-based Don Alberto teamed to acquire Kentucky Oaks (G1) winner Cathryn Sophia, in foal to Pioneerof the Nile, for $2.3 million. Don Alberto also purchased Royal Obsession, in foal to Curlin, for $1.8 million; Grade 1 winner Paola Queen for $1.7 million; and Chilean champion Wapi (CHI), in foal to Curlin, in partnership with Three Chimneys for $1.05 million. Other high-priced mares in the November Sale were For Royalty, dam of Grade 1 winner Constellation in foal to Bernardini who sold to Summer Wind Equine for $2.1 million, and Enchanted Rock, carrying a full sibling to Grade 1 winner and sire Verrazano, sold to Peter Brant's White Birch Farm for $2 million. The auction's 18th seven-figure horse was recorded on the first day of Book 2 when England's Cheveley Park Stud paid $1 million for Fools in Love, dam of 2017 Howcroft Industrial Supplies Champagne (G2) winner Seahenge. Medaglia d'Oro was the leading covering sire with nine in-foal mares sold for $7.91 million. Boosting interest in the November Sale were the first foals by American Pharoah and such other first-crop sires as Honor Code, Carpe Diem, Liam's Map, Bayern, Summer Front, Tapiture and Lea. American Pharoah ranked third among all sires of weanlings by both gross and average. His five weanlings sold for a total of $2.08 million and an average of $416,000. American Pharoah's sire, Pioneerof the Nile, was the leading sire of weanlings, represented by 10 foals that sold for a total of $2.955 million. A colt by Curlin who is a half-brother to Grade 1 winner and sire Violence sold to Andre Lynch, agent, for $1 million to be the sale's top-priced weanling. He was consigned by Hill 'n' Dale Sales Agency, agent. Horses of racing age were featured on Monday and Tuesday, Nov. 13-14, of the November Sale, led by the $440,000 paid by Steven W. Young, agent, for You're to Blame, third in the Bay Shore (G3) at Aqueduct in April. The 3-year-old colt by Distorted Humor out of the stakes-winning Malibu Moon mare Bon Jovi Girl, a half-sister to multiple champion Gio Ponti, will continue his racing career with trainer Todd Pletcher. He was consigned by Lane's End, agent. Taylor Made Sales Agency, agent, ranked as the sale's leading consignor, selling 224 horses for $23,652,500. Taylor Made sold four of the sale's top-priced horses: stakes winner Oscar Party, in foal to Tapit, for $1.9 million; Grade 1 winner Street Fancy, in foal to Medaglia d'Oro, for $1.5 million; Weekend Whim, carrying a full sibling to multiple Grade 1 winner New Money Honey, for $1.4 million; and Life Well Lived, dam of Grade 1 winner American Patriot, in foal to American Pharoah, for $1.25 million. Korea's K.O.I.D. was the sale's leading buyer by number of horses bought, acquiring 59 horses for $1,564,000. On Saturday, Keeneland sold 115 horses for $687,100, down 25.23 percent from the comparable session in 2016 when 149 horses brought $918,900. The average of $5,975 dipped 3.11 percent from last year's 6,167. The median was down 5.41 percent, from $3,700 to $3,500. Two horses sold for $35,000 each to top the final session. Gold Indy, in foal to Tourist, sold to Adel Alatawy. Consigned by Gainesway, agent, Gold Indy is an 11-year-old mare by A.P. Indy out of the Seeking the Gold mare Girl of Gold. A colt from the first crop of Tapiture out of the Fusaichi Pegasus mare Pegastorm brought $35,000 from Clarmont Bloodstock Club. The colt was consigned by Brookdale Sales, agent for Copper Penny Stables. 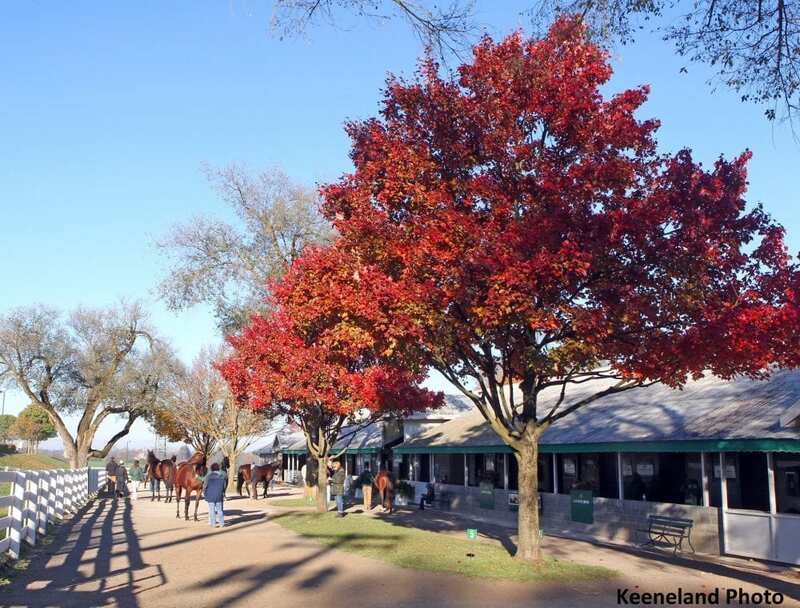 Keeneland thanks its consignors and buyers for their ongoing support throughout the year. The next Keeneland sale is the 2018 January Horses of All Ages Sale, to be held Mon. Jan 8, through Friday, Jan. 12. This entry was posted in Bloodstock, NL Article and tagged bob elliston, breeding stock sale, Donato Lanni, Keeneland, keeneland november, keeneland sale, Lane's End, liz crow, m. v. magnier, stellar wind by Press Release. Bookmark the permalink.